So here we are again talking through another room in the house. This time it is our half bath. You can see on the first-floor drawing below where this will be located. Last week we talked about the entry, which you can read here. This week we will be talking about this tiny space we plan to pack quite a punch. There aren’t many spaces we plan to have a lot of color, but I felt a half bath was a great place to have some fun. It is a small space so I wanted to do something that would be interesting especially since this is the main bath guests would use. As you can tell when you walk in the entry the bath is pretty apparent. Some people may think we were silly, but this is why we wanted to create something beautiful. We saw it as a wonderful opportunity. 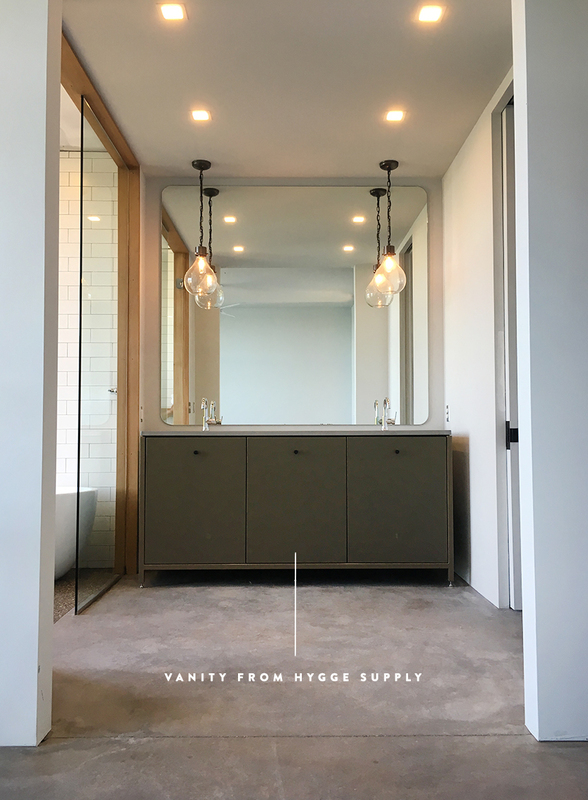 So we decided to make our vanity from Hygge Supply the visual for the room and not the toilet when you walked in. It makes it a nice way of seeing the house without too much feeling of looking into a bath. 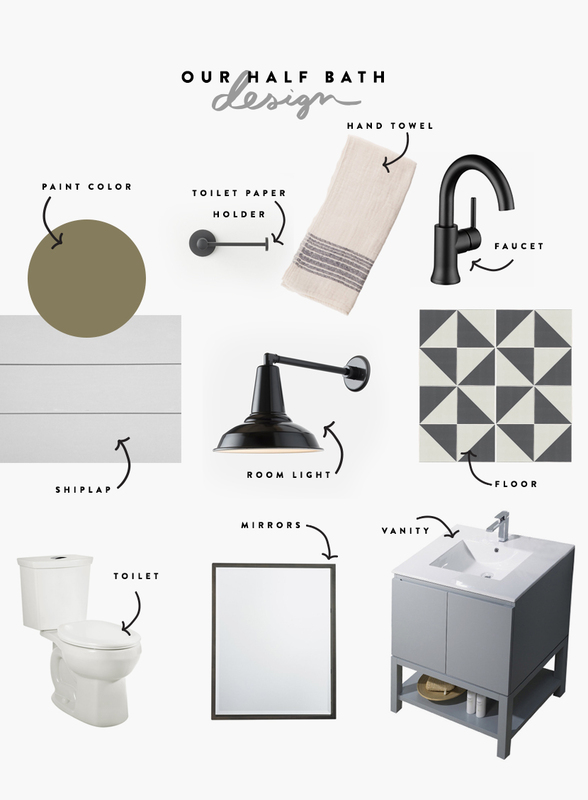 To combine our modern meets classic vibes for our home, we pulled on some inspiration you can see below. First of all, I wanted a deep rich color in there to contrast the white in the natural wood on the floors. I also knew because it was a small space it offer an opportunity to have fun with the walls. So I decided we would do a modern shiplap look in it, but I didn’t want white. So I pulled on Pinterest to show me the way. The above images came to the surface and I ultimately took inspiration for color from our land. I wanted a color that would feel like the green and pines around us but be soft still and feel neutral. You can see the color I chose down below. I also wanted to bring in some funk on the floor, but I wanted to do something fun since we will be partnering with Fireclay Tile throughout the house. Together with them I came up with a fun pattern to really give the space the feel I wanted. To modernize it I used a far more modern look…more on that next. For over a two years we have been working with a friend here locally to help him brand and build a home for his dream; Hygge Supply. He has been creating and developing beautiful and affordable prefab homes around the area, which you can see on his Instagram. Part of that led him to create cabinets and vanities so he could make them the way he thought they should be. Now he has fabricated a whole line and for the first time they will be installed in a stick built home. We are the guinea pigs, but as you can see of the one above they are beautiful. 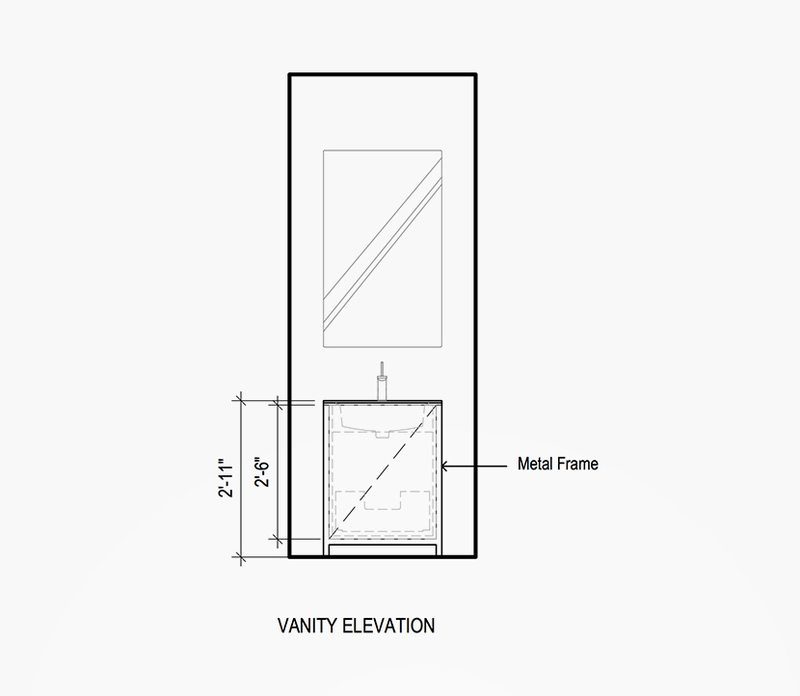 Though the one above will be similar to the one in our Master Bath, we will have the single vanity in our half bath. You can see the elevation below. The cabinets have been thoughtfully designed and are simple and straight forward. You will see them throughout the whole home including our laundry and kitchen. Think of them as a higher end IKEA cabinet internally (fabricated by a company that creates parts for Steelcase) and then flat powdered coated bases and exteriors to keep them tough and easy to maintain. Soon you the site we have built with him will be live and available to peruse. Hang on! It is worth the wait. Till now, this gives you and idea of what we are doing. So as for the nitty gritty of the design, here are our choices or ones very similar to what we are thinking. Paint Color: Sherwin Williams – Olive Grove painted on Shiplap. The goal is to capture the color of our surroundings and the modern feeling instead of a rustic feel. 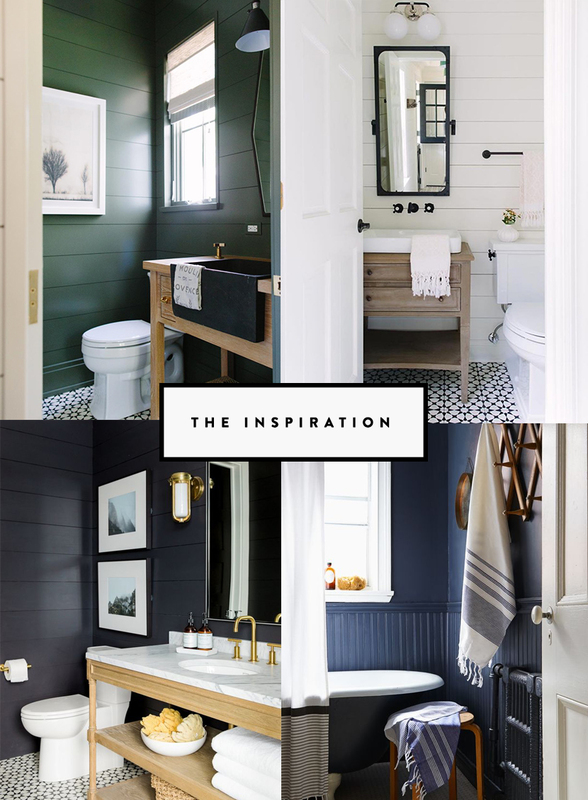 By painting the shiplap in a bold color it makes it feel that much more modern. Floor: We will be using 6″ triangle recycled tile from Fireclay Tile in Halite (white) and Magnetite (black) in a satin finish. The grout will be either black or dark charcoal since this bathroom will be highly trafficked and have muddy feet coming across it. This will keep the grout looking good longer. Lighting: We have 1 can light in the room, but we also are mounting a farmhouse light over the mirror as well. This light is an outdoor one from Schoolhouse Electric, but we loved the modern arm mixed with the farmhouse style shade. Faucet: We went with the single Trinsic Faucet from Delta in Matte black. You will notice throughout our house we went with matte black fixtures. Though this room would very naturally lend to a brass look and maybe it would be more Pinterest friendly, I believe that black will be something we will love longer than the brass so we wanted to use the clean and modern look throughout the house instead of being focused on trends more than is bound to happen. Hardware: Toilet paper and knobs for the vanity will be from Schoolhouse’s True Black collection. We love the way Schoolhouse combines modern and classic so well. 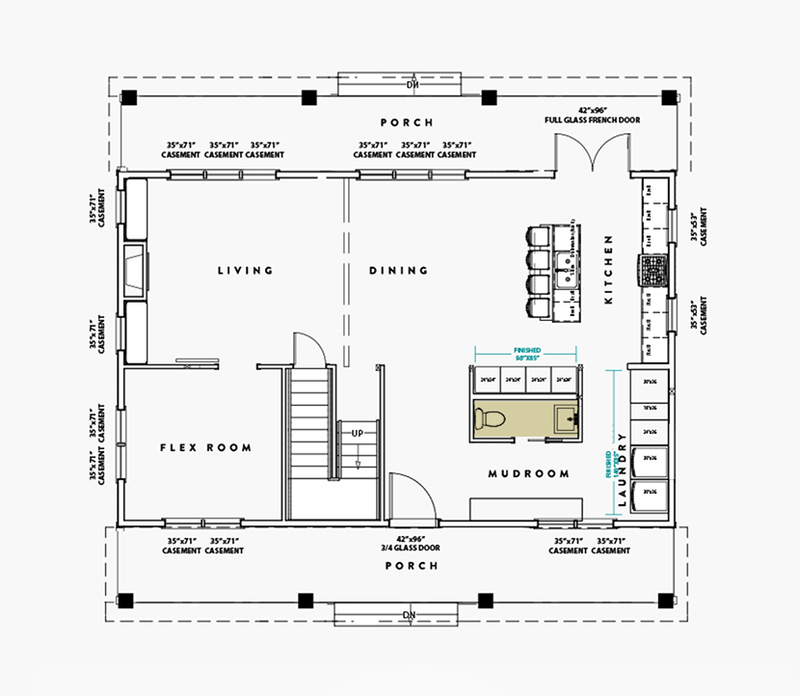 It naturally fits into our home design and we wanted to have great quality since we will be raising a family in our home. It needed to hold up to little hands. Mirror: We will be doing something very simple on the wall here. I have debated about what to do, but I decided to keep this simple, straight forward and let it do its job. So far I love the simplicity. Vanity: This one shown isn’t the actual one, but our’s will be in a light gray and have a white top on it similar to this. The shape will also be similar. This one above is from Houzz so I thought I would offer up something that you could compare with. For the top, we will be using Corian in white because it was inexpensive and works well in bathrooms. We could have done something fancier, but we knew this would be a busy place in our home and wanted something that would just stand up. The best thing is with Corian if it does get stained it is very easy to repair. Important things in our home. Towel: I didn’t show a hook because I am still deciding on that, but I love these towels from Rejuvenation and think they offer up that classic feeling in a modern setting well. So what do you think? Do you think it will do the trick? We have agonized over this space for a while and I feel settled. It feels classic with just an edge of trend, which was what I wanted. I was fearful of creating a space I would hate in 4 years, I don’t think I will be tired of this very quickly. 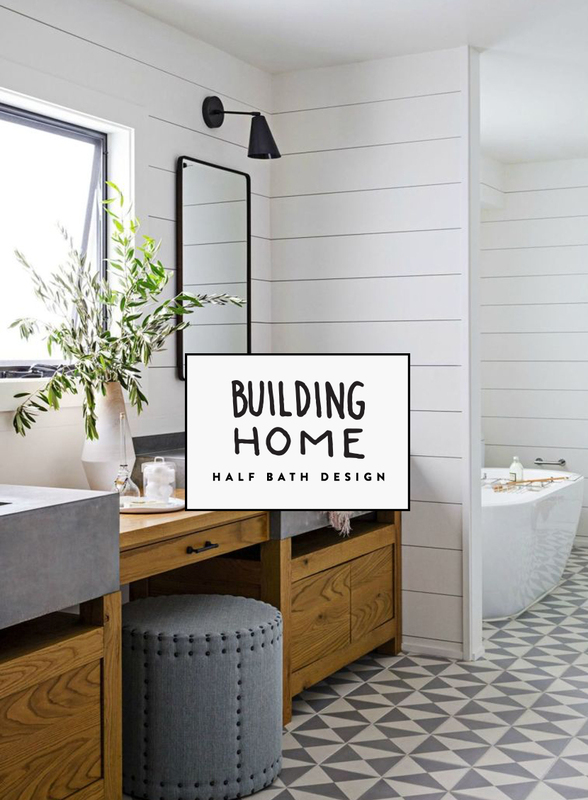 Want more posts about our home process, you can check out this section of the blog and then you can also follow our stories and our hashtag. I have to say, I feel like your posts are just killing it recently. Since your journey of creating a new vision for the blog, I have really been loving the focus, style, and discussion. In a world where social media seems to be taking over even the blogging world, you are one of the few blogs I am still devoted to reading. Seriously – great work and keep it up! Thank you that means a ton. I cannot even explain. We have noticed the blogging world shifting in major ways that you either grow it big, hire on and so on. It is a lot of work to be a one woman show in this industry. Glad to hear the hard work is appreciated and noticed. Lots of long days but I love doing it! Absolutely beautiful and timeless, Megan! It def. screams modern farmhouse 🙂 We have our current study room painted in green (aged olive from Behr) and really like it. It’s woodsy and a great reminder of nature, which we love. Please keep the home styles coming!!! You are such an inspiration for styles that are fresh, modern- yet timeless. Love it so much. OH!!! Awesome!! I am excited about a green room. I love the look and feel of green especially in an olive tone.